Dragons! Adventure#! Magic & More! The second book in the Dragons of Aihrde series, Leech Wyrms brings a whole new wave of monstrous nightmares to the gaming table. Leech wyrms are foul dragons whose habits are more reminiscent of the undead, than the fire breathing habits of the greater dragons of legend and lore. With vampiric lust they haunt quiet dungeons and forgotten pathways, waiting for a warm, ichorous meal to come within their grasp. Whether through hollow fangs or barbed tongues they drain the blood of their victims. From the brutally violent Maegle Wyrm that grinds its prey to pulp or the far gentler Iris Dragon that paralyzes and feeds upon its victim for days, these dragons are creatures from our uncertain nightmares. Each dragon entry is accompanied by a short one piece adventure for a total of 8 short adventures. Inside the covers of Leech Wyrms are 8 new dragons, more dragon specific magic items, campaign information and more. Also included within is the new racial class, the Wierling: the Dragons Riders; and the Peculiar Tale of the Kobold. 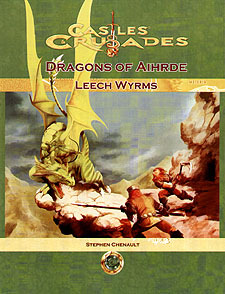 Dragons of Aihrde: Leech Wyrms is not campaign specific, but integrates easily with any ongoing home brew campaign. Each entry comes complete with a separate heading for "The Creature in Aihrde" that can be used or discarded as needed.